Our final interior design project of 2018 was designing custom furniture for a penthouse apartment in Hale, Cheshire. We designed and produced various pieces for this scheme including a large U-shaped bespoke sofa, a completely custom-made dining table made in Olive Ash, bespoke dining chairs with shaped back, a writing desk made in a funky, eco-friendly veneer and a bespoke home bar. The client was very particular about the dimensions of the sofa such as seat height, depth and how he wanted to sit on the sofa. We made this custom furniture piece to the exact specification our client provided which meant, from size to comfort, this sofa was truly bespoke. Due to the sheer size of this table (3 metres x 1.5 metres) and the apartment being located on the fourth floor, we knew this was going to be quite a challenge. 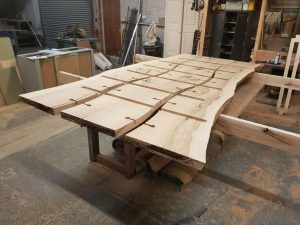 We sourced the Olive Ash from one of our trusted timber suppliers who had large enough pieces in stock. It would have been impossible to get this up four flights of stairs in one piece, so we came up with an idea of joining three pieces together with a ‘wavy’ style joint to make a feature out of it. We also used clear resin to fill any holes and knots, spray finished the top in clear satin lacquer and designed a suitable metal base which we asked our metal suppliers to bespoke produce. 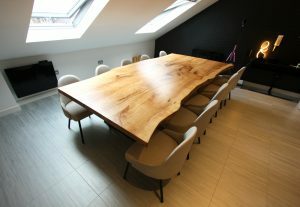 Although we wanted the dining chairs to be unique, we didn’t want to remove any attention from the beautiful grain of the Olive Ash dining table. We decided to create a simple chair design with an elegant yet subtle shape on the back which the client loved. 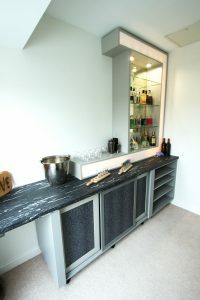 We designed and produced this bespoke home bar based on our client’s requirement for drinks, glasses and bottle storage. We came up with a design with contrasting colours including grey and silver sliding doors with a faux leather inlay, a black worktop and top shelving unit with LED lighted Perspex panels, an antiqued glass mirror back and glass shelves. 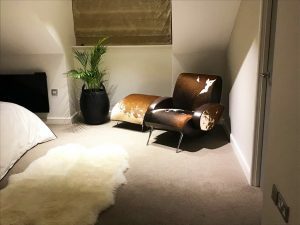 Our client also purchased one our domeba armchairs with a matching stool in real hair on hide from our Jacob Collection and as you can see from the image, it fits in great with the scheme. If you would like to create a truly bespoke scheme or just one piece of furniture , without limitations, a high quality build and great style just email enquires@jacobuk.co.uk, or call our Cheshire office on 01925 419121, or fill in our contact form. We’ll be more than happy to help.